Maybe the entire Jersey shore smells like briny clams with a dash of boardwalk, but to me that alluring aroma is Atlantic City. When I stepped out of the car at the Claridge Hotel last week, my first visit back in 37 years, I took a sniff and told Tony we needed Champagne and clams casino asap. I also needed a facelift, an evening gown and a Jaguar XKE if I REALLY wanted to recreate that sybaritic period of my life, but I know my husband’s limits. I lived in Atlantic City in 1972 and last visited in 1978 when the first casino opened, so my memories of the resort have nothing to do with slot machines and beach bars. The city I knew was a crumbling grande dame struggling to retain her dignity. People dressed to have dinner in the elegant but shabby half-empty hotels. The famous boardwalk was rarely crowded. The Steel Pier was there but the diving horse was gone. Glamorous vestiges of an earlier era lingered, though, especially in the city’s famed restaurants. Under the eyes of maître ‘ds, captains and waiters I learned how to eat raw oysters and clams in one delicate slurp. To the music of a roving violinist, I learned the difference between littleneck, middleneck, Ipswich and cherrystones. I learned what ocean-fresh seafood tastes like. I learned not just how much but how to tip: unobtrusively, with a murmured “thank you” to show appreciation, not to show off. So I was jolted last week when a server at the noodle bar in the Taj Mahal casino asked if I wanted fresh or frozen clams in my bowl of steamers. The $14 menu price was for frozen clams, she said. Fresh clams would be a lot more. “But the ocean is right there,” I protested, pointing to a spot beyond the baccarat tables. I left and got my clams at the excellent Jade Palace noodle bar at the Tropicana, one of three decent restaurants we found. The second was Harry’s Raw Bar at Bally’s, where we had clams casino and raw oysters, and the third was Gordon Ramsay Pub & Grill at Caesars Atlantic City, where we had bad service but an incredible steak. The week wasn’t all about food. I reveled in nostalgia at the last of the gilded boardwalk hotels, the Claridge. It has been refurbished in period décor to its state of grandeur at its opening in 1930. I looked in vain for the bronze plaque that proclaimed we were at Boardwalk and Park Place, the luxury properties in Monopoly, which was patterned on the streets of Atlantic City. Like most of my old haunts, the sign is gone. But the city still smells delicious. Back home, I tried to recreate Ramsay’s deftly seasoned strip steaks. They appeared to be encrusted with coarse salt and who knows what else. Bare-bones recipes I found basically said to season with salt and pepper and grill over a hot fire or pan-grill with oil in a skillet. Allowing the meat to come to room temperature after seasoning is important, as is resting the meat after it is cooked. The secret to the outstanding flavor is using way more salt and pepper than seems proper. I mean way more. Just trust me on this. While I was gone my garden went into high gear, producing my first tomatoes and several yellow squash. 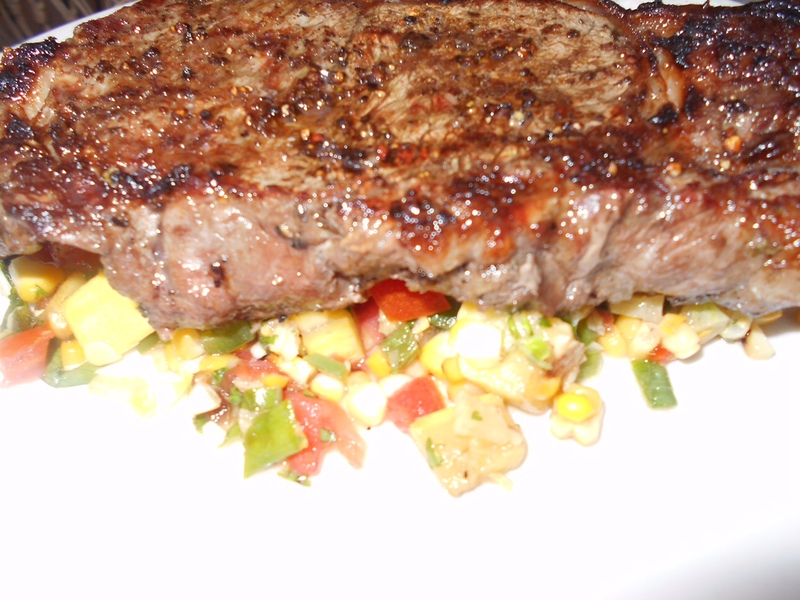 I combined them in a Smoked Corn and Yellow Squash (or Zucchini) Salsa to serve with the steaks. I draped some of the salsa over my steak and snapped a few photos as Tony filled his plate. He heaped some salsa in the center and placed his steak directly on top, as the restaurant did with fingerling potatoes and grilled strip. “This is how Hell’s Kitchen does it,” Tony instructed. He was right. Massage oil into both sides of steaks. Divide brown sugar between the steaks and rub evenly into both sides. Sprinkle half the salt and pepper on the sides facing up and press firmly into the meat. Turn over and repeat with remaining salt and pepper. Let stand at room temperature for about 1 hour or until the meat loses its chill. Build a medium-hot charcoal fire or preheat a gas grill. When coals are ashed over, spread slightly and place meat directly over the hot coals. Grill uncovered for 3 minutes or so, depending on the heat of the fire or gas grill. Turn over and grill about 3 minutes longer for medium rare. Serve with Smoked Corn and Yellow Squash Salsa. Roast corn and jalapeno on a grill or in a dry skillet over high heat until kernels begin to turn brown and pepper is evenly charred. Place pepper in a paper bag and close tightly. Set corn aside to cool. When corn is cool, cut the kernels from the ears into a medium-sized bowl. Peel the jalapeno and discard stem and seeds. Mince and add to the corn. Stir in the squash mixture. Stir in remaining ingredients, adding more salt if necessary. Serve warm, chilled or at room temperature. Q: What exactly is pastry flour, and do I really have to buy it? Can I substitute all-purpose? A: Pastry flour is finely ground from very soft wheat. The softer the wheat, the less protein. The less protein, the more tender the baked goods. This would be a disaster in bread, but is great in pie crusts and biscuits. In a pinch you can make your own pseudo pastry flour by combing equal amounts of cake flour and all-purpose flour. Regarding blueberry pie, Cooks Illustrated adds one grated and squeezed apple (for the pectin) along with some tapioca. I’ve made the recipe a couple of times and I sets up nicely — sliceable but still soft. Check it out. Dear Rob: Thanks for the tip about the apple. Brilliant. I immediately forwarded the Crack Pie recipe from last week’s newsletter to my older daughter, Kendra. When she lived in New York City for 3 years, I would visit every few months. She introduced me to Crack Pie, and I loved it. I recall that she’d bring it to California when we’d all get together for 4th of July or whatever, and share it with the rest of the family. Now that she lives in Oakland, Calif., I don’t visit New York quite as often and don’t get much Crack Pie, so maybe this recipe will save us. When Kendra visited me here in Ohio in May, we went to West Side Market and tried some bacon jerky from Czuchraj Meats. She loved it so much that I had to bring 4 pounds of it to share with her and the family this past 4th of July. Our new food craving! If you can come up with a recipe for that, she won’t have to order it from Ohio. Dear Cindy: Wow, bacon jerky! It’s my new craving and I haven’t even tasted it yet.